For the first time in more than twenty years, Artistic Director Barbara Gaines returns to Shakespeare’s enduring masterpiece of revenge, passion, and deception. Playing the ill-fated prince of Denmark is Maurice Jones (Broadway’s The Lifespan of a Fact opposite Daniel Radcliffe, Romeo and Juliet starring Orlando Bloom and Condola Rashad, Julius Caesar with Denzel Washington). 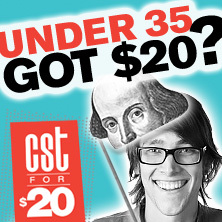 Electrifying performances by an outstanding 20-member cast combine with inventive staging to ignite Shakespeare’s poetry in CST’s uniquely personal Courtyard Theater—making your night out one to remember! Video: "I cannot think of a more exciting place to be"
Stuart Sherman of Fordham University on remembrance and remembering, and the pressure the past exerts on the present. Barbara Gaines sat down with CST’s education team to discuss her production of Hamlet, and how she approached Shakespeare’s masterpiece. A brief introduction to the story of Hamlet, its origins, and its history of performance, from first publication to present-day productions. Barbara Gaines is the founder and Artistic Director of Chicago Shakespeare Theater, where she has directed more than thirty of Shakespeare’s plays. This free series of programs offers lectures and talkbacks on ideas embodied in the play as well as opportunities to meet the cast.